Screenrant ranked the top 25 Sailor Moon villains from weakest to strongest. See if you agree/disagree. Here are some of the rankings. Toei would never do such a thing! Given that PGSM was made by the live-action Toei, there's no reason Toei Animation, a organizationally separate company that live-action Toei owns the majority stake in, would bring up PGSM. Yeah I feel like people forget about this important fact. But wow, what a great list! I usually cringe at things like this because they're often written by people who aren't super familiar with the actual material. The fact that the list includes characters and events from pretty much every big version of Sailor Moon really stands out. This author did their homework for sure. Being the big Sera Myu fan I am, I was thrilled to see that at least Vampir and Dracul made the list. It was also cool seeing the movies get some love, as well as PGSM of course. And I'm really happy that Galaxia and Chaos together took the #1 spot. That makes a lot of sense. I was nervous Queen Beryl would be at #1 and it would purely be for nostalgic reasons on the part of some author who only saw the DiC dub, etc. Galaxia and Chaos both deserve the #1 spot on a list like this. That said, some of the reasons for the list order itself are a bit weird, but that's to be expected. We don't have things like power levels, etc. in Sailor Moon so one has to do it this way. Just like people forget that Kodansha has had a bigger role in both anniversaries (from the 2012 announcement to changing producers & distributors for stuff like the recent Myus, tribute albums & Crystal videos and soundtrack CDs) so they're just as guilty if not more so for not acknowledging PGSM. Toei, Kodansha, PNP, Bandai.... They all need to start acknowledging the live action series. I'm 95% sure there *used* to be a "Tokusatsu" tab on the official website, but that's gone now. Yet there's still an "Other" tab that has never been used. Anyway, the list is cool I guess. In general I don't find list articles very interesting so I don't really have anything to say about it. The #1 is missing in the OP. I had to stop reading at this list right at the mention of Ail and An. Because the two were simply trying to keep their way of life alive, it’s easy to have sympathy for them. When they discovered that the tree that gave them life was “sick” because of the energy they fed it, they attempted to change. What the tree really needed was love, something they were able to do once they stopped acting as the villains of the story. 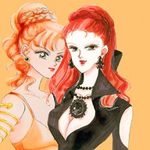 Though the English dub of the series made them connected to the Negaverse and Queen Beryl, the original Japanese anime did not. The original Japanese story made it clear that the two weren’t intentionally evil. First of all, no the tree was not sick because of the energy it was fed. At best, that was an invention of the old dub if you take a certain line in a literal manner. Second, the whole idea of the tree supposedly needing love, while stated in all versions...really doesn't make sense in the original version/Viz dub or its backstory. Viz dub: "I made myself with and grow weak. I was trying to send you a signal, but you didn't understand my plea for love." That doesn't...sound like someone who needed love. Sapient beings who need love wouldn't intentionally weaken themselves for weeks, if not months on end to get it. Especially sapient beings that have the capacity to talk. The tree was not sick. It acted like it was sick. Third, the first dub actually actively made Alan less evil than Ail, making him realize the "lesson" waaay earlier than what he did. Apparently, this person overlooked the fact that Ail told the tree to blow up the planet because he could not have the Andromeda of his heart. He and An may have been somewhat more childlike in the original version, but they were definitely intentionally evil, if not more consistently evil than their dub counterparts who were only nominally working for the Negaverse. You don't have to like the aliens, but praising the original version for what the old dub actually did is wrong. I actually did forget this, so yes, you're totally right. It'd be nice if we could get Kodansha to work with Toei to produce something like a PGSM retrospective book or mook. Yes! The "tokusatsu" tab ABSOLUTELY was there and it filled me with so much joy and wonder at what they could possibly be planning. I was so ready for a second season of PGSM with the Outers in it. Maybe the OP didn't want to spoil anything? Sapient beings who need love that also have the capacity to talk tend to do all kinds of crazy, bizarre, unusual things to get the love they need. Who's to say what a sapient alien tree would do or say (or not say) in order to receive the love it needs? And yeah, if those details are from the DiC dub, the author should mention that. I want to know what the basis is for ranking the Shintenou above The Black Clan and them above Mistress 9 and Pharoh 90 when it seems like the reverse is true. Also the DD Girls...are not that powerful. Just dangerous, underhanded, devious, and willing to die for the cause. The seven great youma are most certainty more powerful than they are. How do you think the sera myu villains Dark Plasman and Dark Sirius will rank ? Also, I do think that the four shitennou really do rank higher than the Black Moon Clan except for Wiseman. After all, they were Endymion's top generals and were definitely more powerful and well trained than the average combatant. PGSM shows a more likely indication of their true power and abilities. I haven't seen PGSM, so I can't comment on the placement of characters from that series. Them aside, the order doesn't make any sense. Like at all. Whomever put the list together doesn't seem to realize that Sailor Moon villains get stronger as the series progresses. That's why Usagi and the other Soldiers need to gain stronger forms and weapons to fight them. Characters on a list of strength should be ranked on their on screen feats and accomplishments. That list looks like the author ranked the villains by how their powers work and their overall effectiveness in the story, which has no bearing on power. While the list seems to be largely based on the original anime, it includes the manga descriptions of the characters as well. This creates a problem. The villains as a whole are more powerful in the manga than they are in the classic anime. So that can potentially alter the order. Nehellenia, for example, doesn't show even half the feats in the anime that she does in the manga. Towards the end of the arc, she shook off a Sailor Planet Attack fueled by Super Sailor Moon, Tuxedo Mask, Super Chibi Moon, and all nine guardians including Saturn. That feat alone puts her above every other villain in the series up to that point. It's quite laughable to see Beryl listed in front of her. And that's just one example. Another is the DD Girls. Them being ranked 6th is baffling. And yet the Animamates are 20th. 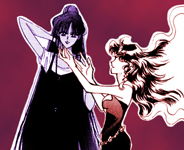 In the anime, Sailor Lead Crow was shown capable of single handily defeating the super versions of the Inners, while going toe to toe with the Starlights and Eternal Sailor Moon. The DD Girls all died fighting the base forms of the Inners. They wouldn't have a chance against any of the Animamates even 5 v 1.